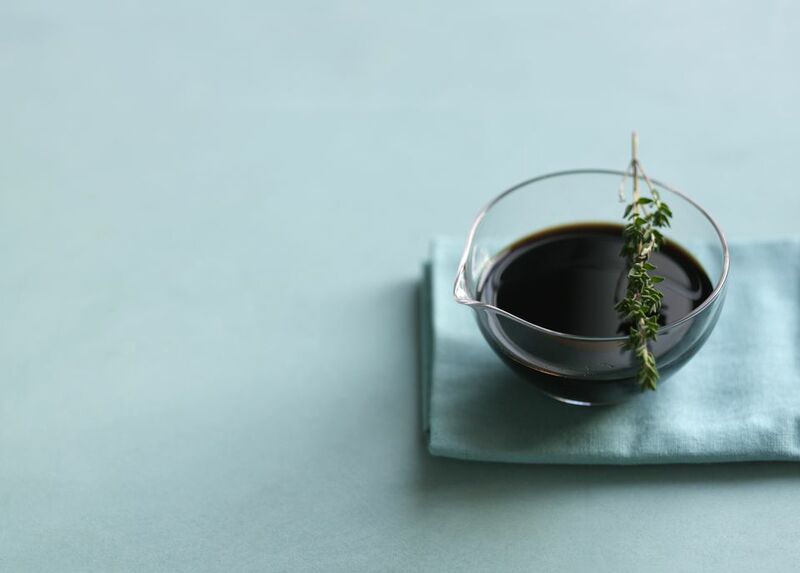 Balsamic vinegar is a popular ingredient in sauces, salad dressings and marinades, but because of the aging process that it goes through, it's more expensive than other vinegars. If you're out of balsamic vinegar, or hesitant to buy it because of the cost, use this substitute instead. 1. Mix the vinegar and sugar (or honey) together to combine. Balsamic vinegar has a slight molasses flavor. To incorporate that into your substitute, use brown sugar, instead of granulated sugar. As you may already know, brown sugar gets its color and flavor from molasses. Using apple cider or red wine in your substitute will help to give it some of the fruitiness and tanginess that balsamic vinegar is known for. 2. Use your substitute in place of one Tablespoon of balsamic vinegar. Double or triple the amount, if your recipe calls for more. This sub is easy to scale to your needs. Replace the balsamic vinegar called for with an equal amount of balsamic vinaigrette. This will add olive oil to your recipe, but that should work just fine in the types of recipes that call for balsamic vinegar. Mix together equal parts lemon juice, molasses and soy sauce. This will give you a good flavor (and color) approximation, and it doesn't require any fancy ingredients. Just pull a few things from your pantry and fridge and you're in business! Balsamic vinegar has a uniquely-complex flavor that is sweet, fruity and tangy all at once. Authentic, aged balsamic also has notes of oak, or whatever type of wood barrel it was aged in. The aging process results in a mellow vinegar. You'll find that it doesn't have that strongly-acidic bite that other vinegars have. Balsamic vinegar is dark brown in color, and has a syrupy consistency. So, when you use it in a recipe, it contributes color, in addition to flavor. Vegetables that have been roasted in balsamic vinegar are especially gorgeous. The price of balsamic vinegar varies greatly. A traditionally-made bottle (one that has been aged for many years) can go for as much as a good (or really great) bottle of wine. But there are certainly more affordable bottles of balsamic vinegar to chose from. If you're on a budget, look for a condimento grade of balsamic vinegar. That's one that hasn't been aged for as long (usually somewhere in the three to seven years range). While it won't have the same depth of flavor as a traditional bottle of balsamic, it'll have more than enough flavor to serve its purpose in your recipe. Since the condimento designation isn't regulated, there are some fakers in the bunch -- companies that enhance the flavor of regular white or red vinegar by adding a splash of grape must. If you want to find a good bottle of condimento balsamic, look for one where grape must is the only ingredient, or at least the first ingredient on the list. DId You Find This Substitute Helpful? If so, be sure to bookmark or pin my complete list of ingredient substitutes before you leave. It has over 70 substitutes. That's enough to get you out of just about any cooking jam.